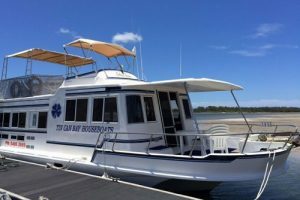 Tin Can Bay Houseboats (TCBHB) is a houseboat rental company located in Tin Can Bay , Queensland. 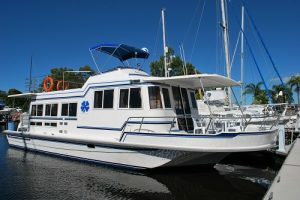 Our aim is to supply the most affordable houseboat holiday cruising the Great Sandy Straits and Fraser Island. 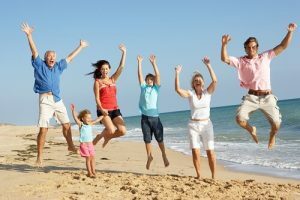 We pride ourselves on our personalised service and will do all in our power to supply our clients with a holiday experience second to none. 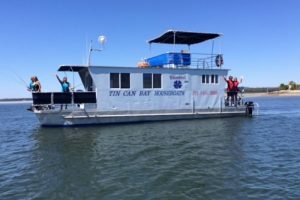 Tin Can Bay Houseboats offers exceptional holiday packages that are affordable and flexible to your needs. 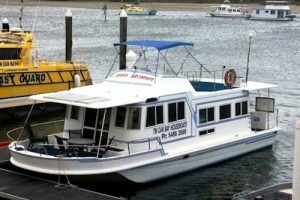 A Tin Can Bay houseboat rental will ensure that you get to experience the pristine waters of the Fraser coast in comfort and style. Our houseboats are modern, stylish,comfortable,clean and fully equipped . 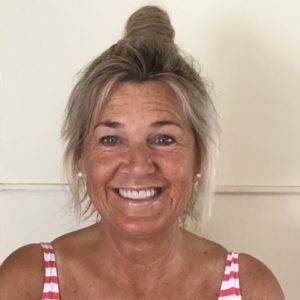 When you hire a houseboat you will experience all the fun of being your own skipper and enjoy the freedom of being able to drop anchor wherever you choose. All our boats are a minimum 2 night hire and hire cost includes a 4.1 m polycraft tender with fuel. Hi, I’m Margot and I’m delighted to meet you! I think you’ll find houseboating to be the best way to holiday and I’m willing to go out of my way to ensure you have a fantastic time! Many of our clients are regulars and it’s lovely to see them and catch up on all the news since their last visit. I own and manage this business so it’s crucial to me that you are happy and satisfied. You are our priority and it is our goal to ensure you are aboard a well presented, safe houseboat and receiving nothing less than great service from us during your stay. 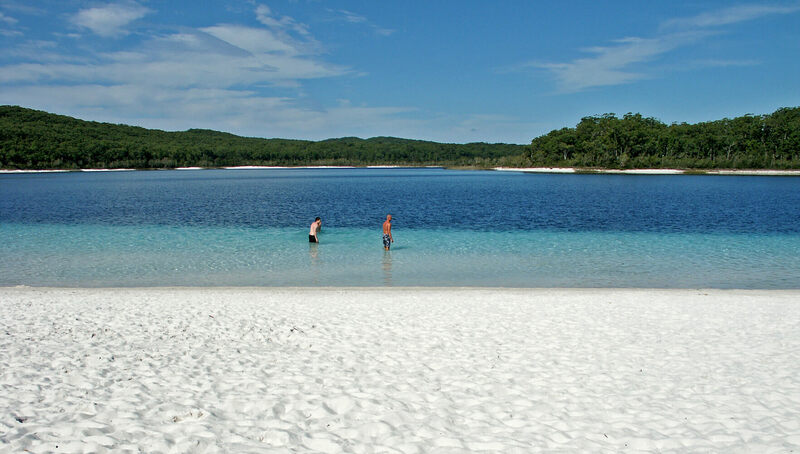 Located on the Cooloola Coast 2.5 hrs drive north of the Queensland state capital Brisbane and just off the southern tip of Fraser Island. 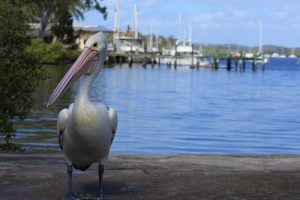 The seaside town of Tin Can Bay is a popular holiday destination and launch pad to the aquatic playground of the Great Sandy Straits – a pristine waterway protected by World Heritage listed Fraser Island. Closest airport is Maroochydore ( Sunshine coast ) which is approx. 1.5 hrs drive. No you don’t, you will receive full instructions by our skipper. A comprehensive briefing is given to you before you take over the houseboat. A coxswain will take you out into the Sandy Straits and will ensure that both you and he are happy with your handling of the boat before leaving you. At the end of your holiday he will bring you back into the jetty. All you need is your food, drink and towels. Will my mobile phone work whilst out on boat? All carriers (except Vodaphone) will receive service in majority of areas around the Sandy Straits. All boats have a 240 volt inverter for charging. Our boats are available from 7 am on day of departure and due back by 10 am at the end of your holiday. Is there a safe parking for our vehicles? Yes we can provide secure parking at a cost of $10/night/per vehicle. Your houseboat comes fully filled with fuel but you will be charged for what you have used upon your return as well as your gas usage. Is there a boat for the “ less able “? Yes, we would recommend the Whimbrel, as there are no steps or stairs inside, and more open space aboard. We have had folk in wheelchairs aboard, but they have had some independent mobility, which is necessary to access the toilet and shower. 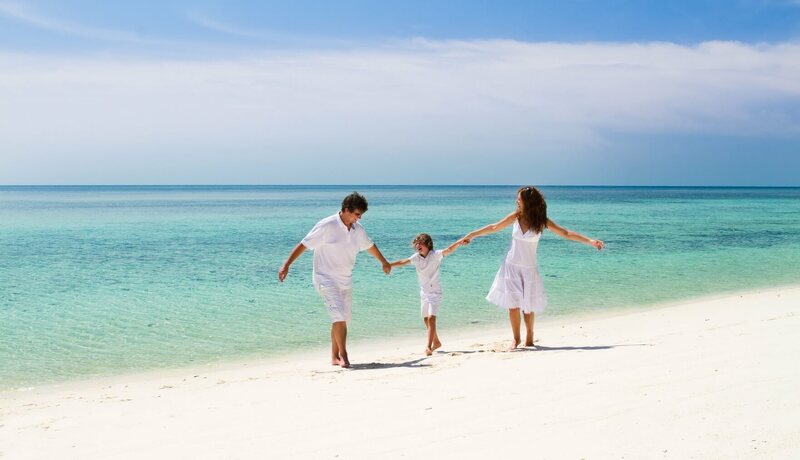 Are you in need of a holiday? Our House Boats provide the perfect getaway. A holiday on a houseboat is a holiday with a difference. 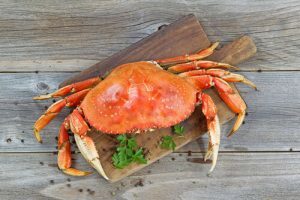 It cannot compare to a holiday on land!! Get away from the “city life” and wake up with a different view every morning. You are the “captain” of your vessel, no boat licence needed and all our boats are easy to manoeuvre . 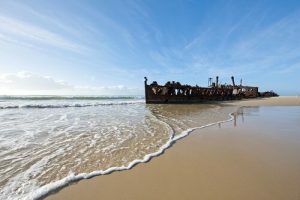 Complete and utter freedom to enjoy the picturesque sights and sounds of the magnificent Great Sandy Straits and Fraser Island. Contact us today to book your houseboat holiday ! !